From running a successful business to being a great parent and partner, mompreneurs have a lot to juggle. A study by the creative platform 99designs found that 71 percent of working moms are the primary child care provider in the family, and 39 percent regularly shift their focus back to business once the bedtime duties are done. The study also found that owning your own business has a benefit you can’t find anywhere else: flexibility. Sixty-nine percent said it’s the number one advantage of being a mompreneur. If you’re a mom who owns her own business, you can make it work by finding solutions to your most common challenges. 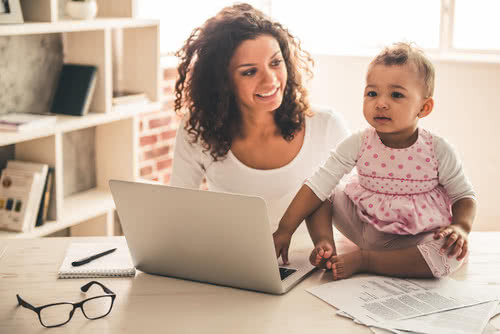 Here are seven tips for working moms who are ready to take their businesses to the next level, while balancing their work and professional lives. Owning a business can be more time-consuming than holding down a full-time job, but the 99designs study found that 55 percent of mompreneur business owners spend less than eight hours a day on their business. That means it’s imperative to get more done in less time. Start your day with a schedule that includes your top three priorities for your business, as well as the things you have to do at home. Instead of trying to manage time, manage your energy. Tackle tasks that require more brainpower during the time of day when you feel most focused. Using your time well means setting realistic goals — and expectations. The classic business book “The E-Myth” by Michael Gerber taught us that there are times when you’re working on your business, such as creating growth strategies, and times when you’re working in it with day-to-day operations. Successful mompreneurs strive to strike a balance between both. To see how well you’re doing, look at your to-do list and highlight the tasks that grow your business. If they don’t fill at least half of your day, it’s time to rethink your priorities as a business owner. You’re in business to make money. Use the SMART method to set goals that are specific, measurable, achievable, relevant and time-bound. For example, set a goal for achieving a set number of sales by the end of the month. Or plan to reduce your expenses by 20 percent by the end of the year. When you pay attention to your finances, you make better decisions. You are the average of the five people you associate with most, so surround yourself with other entrepreneurial-minded people. According to the 99designs survey, 63 percent of mompreneurs belong to a network of fellow mom business owners. Check out sites like The Mogul Mom or Boss Mom for working mom tips, or check your local MeetUp for local mompreneur groups where you can bond in person. To find balance, you’ve got to learn how to say “no,” but this can be harder than it seems. Whenever a request is made, instead of saying “yes” right away, say, “I’ll get back to you.” Then, weigh the benefits of adding a task to your calendar against the inconveniences it may cause. “No” doesn’t have to mean “never.” It could just mean “not today.” Prioritize the important, and make decisions about your workload in a way that is best for you and your family. Be proactive about your finances by setting aside money for emergencies and setting up small business loans that can cover capital expenditures as well as day-to-day expenses. Having ready funds can offer peace of mind if one of your customers is late making payments or if you have an unexpected expense or emergency. Forty-four percent of mompreneurs sometimes feel guilty about owning their own business, according to 99designs. This is likely because they have to miss events, like soccer games or holiday parties at school. Guilt is a toxic emotion that doesn’t serve you. The best way to get over it is to stop giving it energy. Being a mompreneur is rewarding on several levels. Not only can you bring in money to help support your family, but you can follow your passion and be your own boss. Perhaps the best benefit, though, is being a strong role model for your children. Whether you realize it or not, kids are always watching. When they see their mom going after her dreams and making a difference in the world, they’ll believe that they can do it, too.